Last Saturday, my company had a charity event called dwp Care. This is an annual event that dwp gives back to the community in need. This year, we invited children from House of Grace to our office in Bangkok and then brought them to Ocean World for a fun day. House of Grace is a charity organization for children with HIV. There were 50 children joined us last saturday. They ranged from 18 months to 19 years old. When the arrived at our office, we served them some juice and snacks. 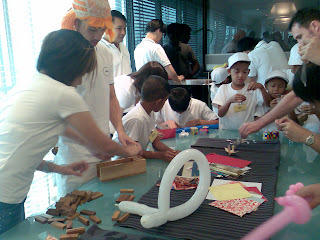 After that, they did some fun stuffs like painting on a large canvas that we had prepared for them, origami, some IQ games, and etc. 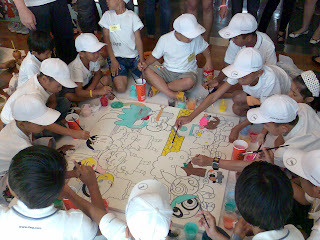 One of the meeting room was converted into a game zone, and another meeting room had Cartoon Network to entertain them. For lunch, we had ordered KFC and Pizza Hut that the children seldom have the chance to eat. 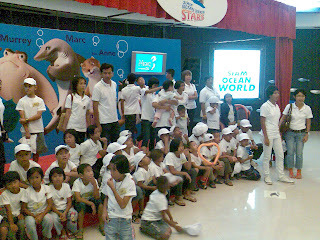 After lunch, we brought the children to Ocean World Bangkok. Throughout the day, I tried to communicate with the children with body language and my very very limited Thai language. I tried to ask them ‘What is your name?’ etc, but it wasn’t successful at all. 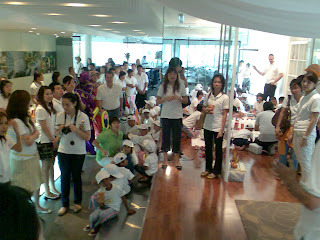 But with the help of my Thai colleague, I was able to play for a few minutes with some of the children. When I thought about the children who looked so normal were actually HIV carrier really made me sad. These are innocent children who have been brought to the world to suffer. All of these are caused by the irresponsible parents. But all the damage had been done. All we can do is to hope that scientists can discover cure for AIDS patients. But for now, the least we can do is to have a fun day with the children. At least I saw some happy face at the aquarium. It made it all worthwhile. good to see that your company is contributing in bringing joy to these children. i'm sure it means a lot to them. we are so lucky... just to think about it. yes, we are certainly very lucky compared to the children. Too bad that I couldn't communicate much with the children cos they are so cute. Wish I could play with them and make them laugh.